Most dogs would naturally prefer an open habitat to roam and explore, rather than to live behind walls and fences. Dogs have a natural exploratory drive to check out their environment. Dogs are social animals, and when left in isolation the only social contact may be elsewhere. Never has the opportunity to explore outside their own fence. Life looks more interesting on the outside. Seek out social contact with other dogs or people. When dogs don′t have a routine of getting out of the house and yard they may attempt to escape their confines to explore. Many dogs, if left in isolation, will seek out social contact with people or other dogs and often seek out a school or playground to be in the company of children. Thunder storms, loud noises, or fireworks and cause a dog to panic and escape the yard. If your dog is in this category, keep your dog confined in a reasonably quiet place indoors. Turn on a radio to help block the noises from outside. If your dog suffers from noise fears and phobias, read and follow the procedures in the chapter on “Fears and Phobias” in John Rogerson’s book, “The Dog Vinci Code”. Unaltered male dogs will tend to roam in search of a female dog in heat that they can smell from great distances. We do not recommend the buried perimeter, invisible fence, or any type of underground fence system. There are several concerns with these types of systems. Dogs can develop behavior problems like aggression and increased levels of frustration. These systems do not deter other dogs from entering the yard. These systems do not deter people or children from entering the yard. If the dog is left unattended on an un-fenced property people may enter property and meet an unrestrained territorial dog, and or aggressive dog. To avoid problems with dogs escaping and roaming, secure your yard, do not leave your dog unattended in an unsecured yard, and take them out for walks and play regularly. Dogs that have a predictable schedule of outings and quality time with the family are much less motivated to escape. If your dog does escape, when you gain control over him again do not punish him or show any anger, nor shower him with affection. Punishing him will only discourage him from coming back the next time and giving him affection or treats will just reward the behavior. It is generally far better to act indifferent and aloof. Fulfill your dogs companionship and social needs! Give your dog more exercise. Get out and take a walk together. Stop and smell the flowers, and let your dog explore and appreciate the world also. The vast majority of time boredom and loneliness is the reason dogs escape and roam. One of the worst punishments you can inflict on a person or dog is solitary confinement. Most dogs are social animals, and when left in isolation they will seek out social contact with other dogs or people. A dog needs; social interaction, exercise, mental stimulation, food, water, and companionship. Since most people can’t spend all their time with their dogs, it is important to leave behind a tired dog that is ready to rest while you are away. Exercise your dog before going, (Don't make excuses, find a way) and be sure to leave them lots of safe toys to help break the boredom. A large yard is no substitute for walking or exercising your dog. Even if your dog has 40-acres to run, most will spend the vast majority of he time waiting near the back door for someone to come out or to be let in. Some believe that dogs are meant to live outside. This is true for a livestock guarding dog like an Akbash that lives with and protects sheep from predators. But for generations, these breeds have been acclimated to the climates that they are asked to live and work. Humans have used artificial selection to develop every domestic breed of dogs we have today, and many of these dogs were never developed to live in the climates that we have placed them in. Dogs, like any other animal, will seek out a place that provides security and protection from the rain, sun, heat, cold, wind, etc… and some level of comfort. It’s highly unlikely that given a choice a dog would seek out and choose your backyard. This can be verified with a simple test: “the gates test” as proposed by Bill Bennett to judge a country. His is a simple test that we can also apply to dogs. Simply stated, which direction do people or dogs run when there are gates? Do they strive to get in, or risk life and limb to get out? If your dog is climbing over the fence, raise the height of your fence. 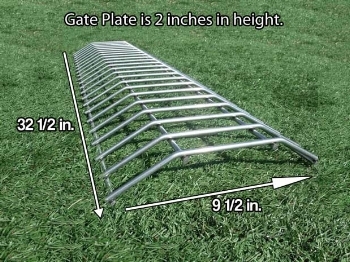 Another option would be to install Coyote Rollers on the top of your fence, but the fence must be structurally sound and ideally a minimum of 6’ tall. The Coyote Rollers act like large rolling pins across the top of the fence. They are designed to make it difficult for dogs, coyotes, and other animals to get a foothold at the top of the fence whereby they can pull themselves up and over. Secure the yard from escape, do a complete job the first time. If the yard is secured only slightly better after an escape the dog can learn that if they persist in their endeavors at escaping they can succeed. Eventually they may hurt themselves in their attempts. Far better they learn right away that the yard is escape proof. Secure the yard from top to bottom the first time being careful to not overlook any avenues of escape. Roll Guard, Inc.'s "Coyote Roller"
A coyote roller is a 4-foot long, aluminum extruded ribbed roller, designed to prevent animals from getting the foothold they need to climb over a fence. It is simple, safe, humane, requires no power source. It is maintenance free and constructed to last a lifetime. The Coyote Roller is manufactured from the highest quality products that never wear out, never require servicing, and are 100% weather proof. It is recommended that the fence be a minimum of 6 feet tall to prevent dogs and coyote's from jumping the fence. Coyote Rollers are available in four finish colors: Raw Aluminum, Black, Beige, and White. 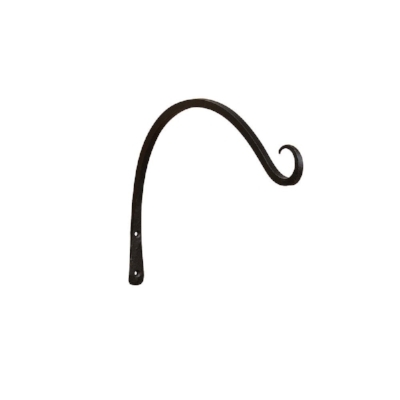 Mounting brackets are available for: Block Wall, Chain Link, Vinyl Fence, Wood Flat Top, Wood Dog Ear, and Wrought Iron. Coyote Roller with Black Powder Coating Finish. Coyote Roller installed on top of wood fence. Another option is to install a wall mounted basket holder near the top of the fence and secure deer netting on the body of the hook with zip ties that have UV protection. Video of deer netting installed on fence. If your dog or cat is a climber, don't place a dog house next to the fence. It can be used as a platform to get over the fence. To keep cats in the yard Purr...fect Fence has several options. Dig Defence is a patented drive-in ground fence panel that extends the protection of any fence or enclosed area. These welded strong 4 gauge steel rods are proudly MADE IN USA and completely galvanized to create a long term (if not permanent) solution. Dig Defence is quickly becoming known as the most cost effective drive-in fencing system on the market. It’s “easy to install” design improves and surpasses all former solutions by eliminating all labor cost associated with digging or trenching. The strong steel drive-in units solve multiple problems simultaneously to save time and money. Dig Defence products were first introduced as a solution for home owners to keep pets safely in and pests out. Now, Dig Defence is protecting airports from invasive wildlife and creating opportunity for several businesses to expand and grow in other industries i.e. Pet, Fence, Landscaping, Construction, Pest and Animal Control, Farm/Ranch, etc. Dig Defence installed along fence and gate. Our fence acts as a flexible net that prevents dogs and other animals from climbing. The bottom material is flared in towards you and secured with unique ground stakes to create a dig guard. You don’t have to dig any holes, mix cement, or make any changes to your landscape. Make the environment a place your dog has no desire to escape. If your dog is your friend and not your prisoner, I think it makes much more sense to secure your yard and make your dog's home more desirable and make their life more interesting! For more ideas to entertain your dog, go to the "Enriching Your Dog's Life" page. Choose Interactive Dog Toys that are tough and strong to keep your dog busy. Although nothing is indestructible with aggressive chewers these toys are among the best and they are made in the USA and are easy to clean. Dog toys help to reduce boredom, stress, and frustration for dogs and puppies.